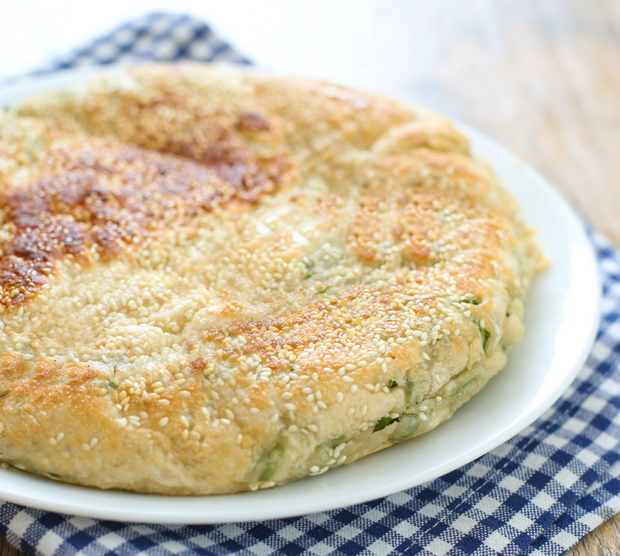 Chinese Sesame Scallion Bread (also sometimes referred to as Sesame Pancake, 芝麻大餅, pronounced zhi ma da bing), is a fluffy, thick bread filled with scallions and crusted with sesame seeds. It’s commonly found in Northern Chinese cuisine and is especially popular in Islamic Chinese cuisine. I’m interrupting the holiday themed recipes to share this bread I made the other day. It’s my first try, and while I do want to continue to improve it, I’m pretty excited to share my first attempt with you. 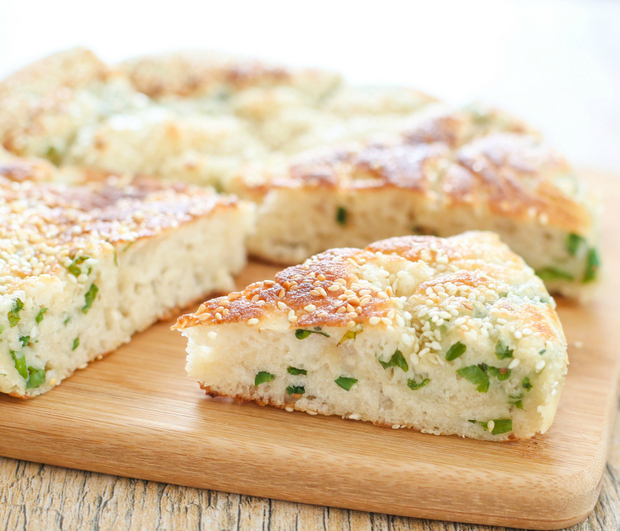 Chinese sesame bread is something I’ve enjoyed for years. I always order it when we go to a Chinese Islamic restaurant. I’ve never thought to make it myself because I thought it would be too complicated. But it isn’t! I’ve even included step by step photos to show you. I learned the recipe from my mom, who was taught how to make it recently after a random encounter with a stranger at the supermarket. Last year my mom retired and since then she’s been a social butterfly. A few months back, a complete stranger started talking to her about persimmons, which led to them agreeing to exchanging fruit from their respective gardens, which somehow led to the woman inviting my mom over to lunch at her friend’s place. This led to my mom meeting this other woman who loves making all these Chinese dishes like sesame bread and dumplings, which led to my mom attending one of her weekly classes and joining their group of friends. And now my mom knows how to make Chinese Sesame Bread. Crazy right? I swear, when my mom started telling me this story and she began with agreeing to meet up with some stranger, I did not think the story was going to end well. So I went back with my partially written recipe, did some additional research, and came up with this. I really loved how this tasted. I did notice that mine is lacking the distinct layers I see in the restaurant versions, but the taste is right. I’m going to try fiddling around to see how I can create more defined layers. Also I need a bigger pan! Since it’s just the two of us, I don’t have any super huge pans and this one got a bit squished in my dutch oven. I can’t wait to make this again. Mr. K and I devoured this in one day. 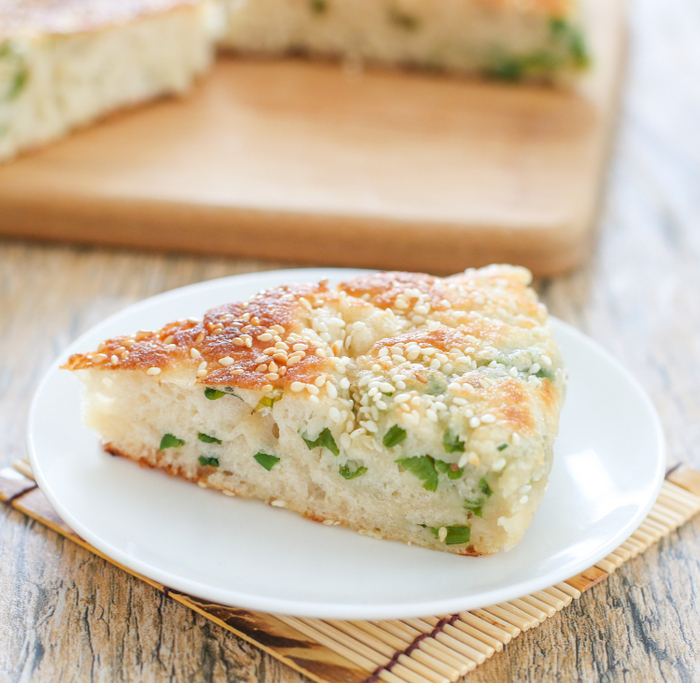 Chinese Sesame Scallion Bread is a fluffy, thick bread filled with scallions and crusted with sesame seeds. It's commonly found in Northern Chinese cuisine and is especially popular in Islamic Chinese cuisine. 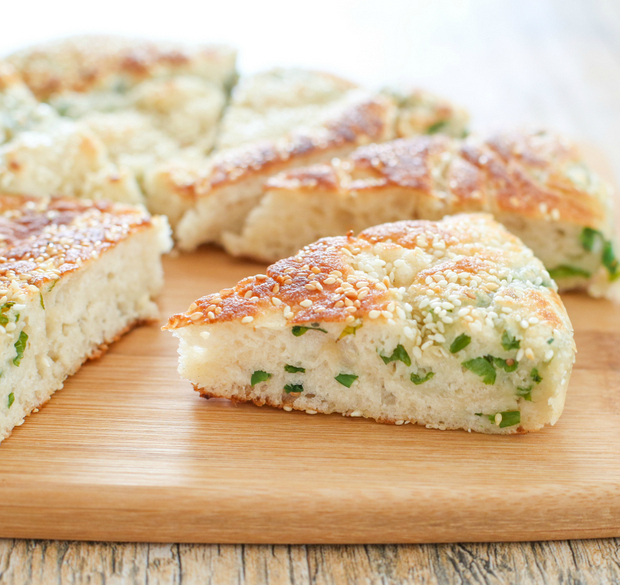 This savory bread is easy to make but the dough needs time to proof and rest, so be sure to account for that time when you make it. In a large bowl, add flour, sugar, oil, salt, water, yeast. Using the dough hook attachment of your stand mixer, combine ingredients until dough comes together and then knead on low speed for 2-3 minutes. The dough will be quite sticky. You can also do this by hand, which is how my mom did it. Lightly grease another large bowl. Gather dough and place into the greased bowl. Cover with plastic wrap and let the dough rest in a warm place until it doubles in size, about 1 hour. Sprinkle both sides with sesame seeds, so that the exterior has a sesame crust. I used about 2 tbsp per side. 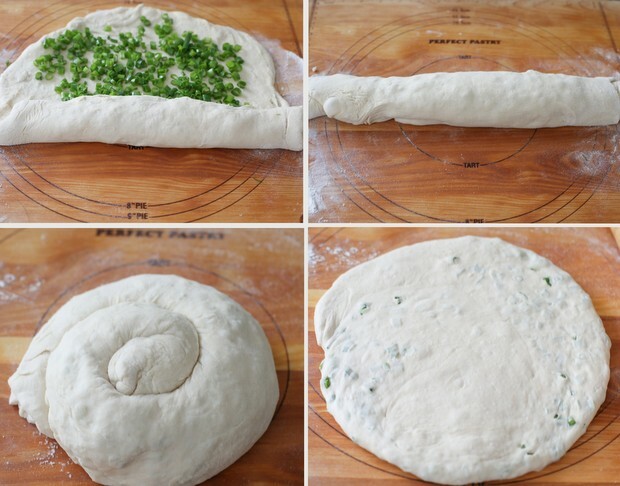 Let dough rest for about 20 minutes. Using an oversized pot or pan, add oil and preheat. Once the oil is hot, slide your bread into the pot/pan. Cook each side for about 7 minutes on medium high heat until both top and bottom develop a brown crust and the inside is fully cooked. Slice and serve. Bread is best enjoyed warm. Oh good idea. I will try that. I know I do that too for scallion pancakes. I will be making this tonight!! It was a little hard to flip. I used two big spatulas at the same time. I actually thought about whether I should try doing it in the oven. I imagine it should work. It’s very much like traditional bread, but made Asian with the scallions and sesame. hehe. Yeah this totally reminded me of scallion pancakes. Even though they don’t taste similar, it’s a very similar process for making it, down to the spiraling. Ha ! Ha ! Ha ! Very funny! The bread looks good. thank you! I will try to continue to improve on it. 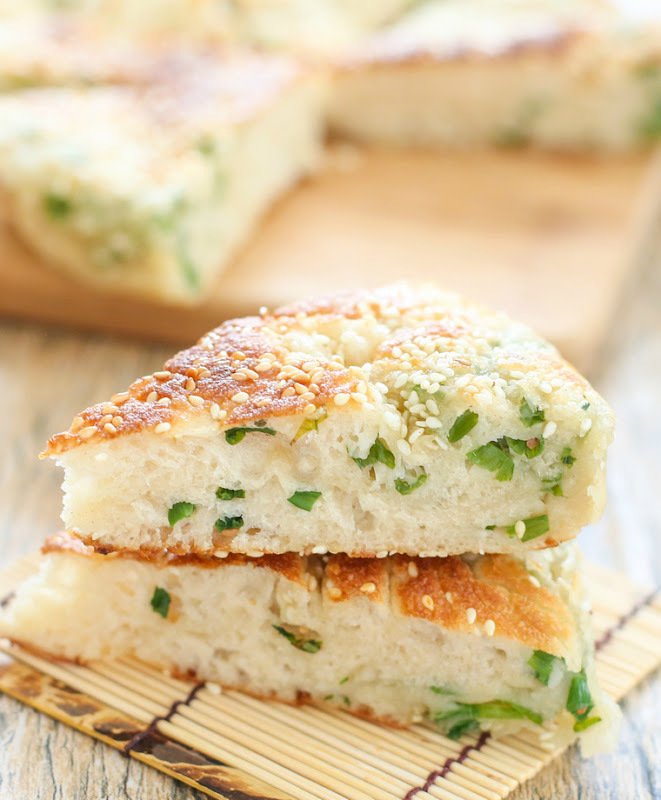 I’ve never made a sesame/scallion bread before.. definitely curious to know what the combination tastes like. Definitely a recipe I need to try! You could try using sesame oil or olive oil. Maybe the taste would be more authentic then? I’m sure it would taste good with either, though sesame oil is so strong so you could only use a little. I didn’t have any issues with it tasting authentic though. mine tasted fine! I’ve never had this bread before, so I decided to make it. It is absolutely wonderful! I didn’t have a pan big enough, so I baked it at 190 degrees celsius for 15-20mins and it came out great! this looks just delicious, & I’ll be trying it soon. I make most of my family’s bread, & have gotten pretty good at it. I’ve got a couple of Peter Reinhart’s books on baking; for excellent ideas & how-to’s, you can’t go wrong with his books. I had one thought (and will try it myself: instead of vegetable oil, why not use toasted sesame oil (sold in the oriental area of your grocery store). It should really ramp up the sesame flavor. sounds like a good suggestion. i’ll give it a try next time, though I wonder if it would be a bit overwhelming. when i use sesame oil, I only use a tiny bit because the flavor tends to be so strong. 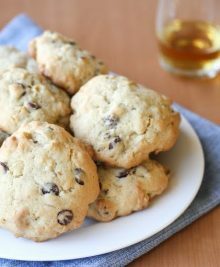 I’m wondering if I can pre-make the dough to bake/fry the following day for a dinner party? Any thoughts? We had these amazing peking duck sandwiches that uses the bread above in NY and my family is clamoring for me to make it for them at home for their uncle and his wife, but I work all day and have time now to do the dough. It’s always tricky if you try to make the dough the day before. The yeast in the dough means it will keep rising if you let it continue to sit, so I don’t recommend making the dough ahead of time. Hi Kirbie, So i’ve been trying to recreate the sesame bread I ate in Chinatown in NYC. Not sure if you ever visited Vanessas or Prosperity Dumpling on your travels, but they make the most wonderful sesame bread sandwiches stuffed with peking duck, roast pork, etc. I tried you recipe last night and it was close. My dough seemed to rise nicely, but after cooking it, it seemed to flatten a bit more than what i had in Chinatown. They split the bread and stuff it. Did you find the dough difficult to work with as well? It stuck to everything. I’m glad I found your recipe as a base. I’m going to let it rise for quite a while longer today. 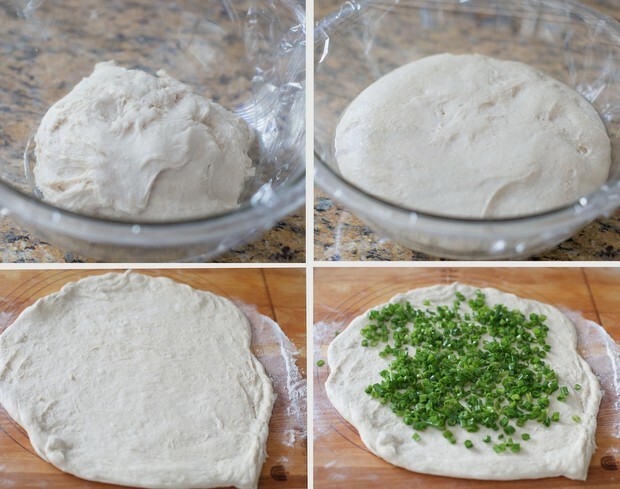 Have you experimented with the dough in other attempts? hmm, I did not find the dough difficult to work with. Make sure you use enough oil. Also are you using instant yeast? 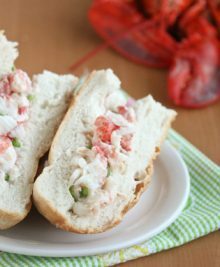 You need to tweak things if you are using active dry yeast. instant yeast also doesn’t stay fresh as long and needs to be changed out every few months. Maybe my dough was sticky b/c i weighed the dough. I try to do weights vs measuring cups, but that can definitely result in less flour. I also did use active dry yeast, but it was a fresh bottle. I will try again, maybe just eyeball the dough so it’s not as wet. Back to the drawing board, thanks for the response back. You could always try adding a tiny bit more flour if it’s too sticky, but yes, I’ve found sometimes weighing it can result in less flour. hope you get it to work! I seen this with unions and like they said before, you layer it with oil and salt, then flip and layer again, to get the nice layers that falls apart when you eat it. I’m going to add this to my existing recipe. thanks. We experienced wonderful Chinese Sesame Seed Pancakes at a restaurant so I went searching on Mr Google. Came across your wonderful recipe and am looking forward to trying it. The restaurant version did not have scallions in it ( though we are familiar with onion pancakes ); they served it with Pulled Pork. Tremendous dish, and very spicy! I’ve had the non-scallion version too! Hope you enjoy the recipe! I’m so excited to give this a try. Like you I’m always trying to pull together several recipes to get the desired results. Not sure if you’re able to read Chinese but at step 9 the blogger talks about how to get layers. She says the trifold method is what gets layers, whereas the rolling method would make the layers disappear. I made this tonight and it is excellent. Came together easily but I may have had the burner on the stove a bit high as the first side was a perfect golden brown at 4 minutes., I turned it down, cooked the other side the full 7, and it turned out beautifully. It needed more salt in our opinions, but with a little sprinkle of salt, we loved it. I will definitely make again. Thanks Kirbie, for a great recipe!